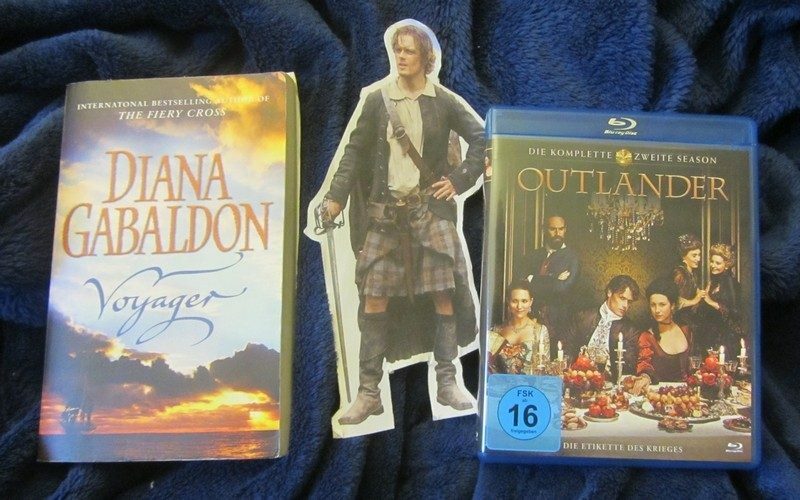 I could ramble now about how I wanted to pick up with these “Adapting Outlander” posts for a long while and what kept from actually following through. That would be boring though. I think last week’s footage of some of the Edinburgh scenes actually being filmed in Edinburgh, off the Royal Mile and to see Fergus and Young Ian in character, but also Cait & Sam meeting fans over and over again, gave me the final push to compile this post. There is so much happening in these two chapters, that I have no idea how they will actually condense that into one episode or even less than one. I have no idea how they will tell the whole smuggling plot in Edinburgh, because there are so many people involved (Jamie’s men, the excise men, Sir Percival…) and after listening to these two chapters I still haven’t quite figured out (or remembered) who was doing what with whom and why. It makes my head hurt to think of a way to tell that part of the story for TV. So I leave that to Ron and the writers. While they’re at cutting down the story to the vital plot points I also hope they reduce Mr. Willoughby’s part a bit, at least his weird fetish on Claire’s feet and his overly apologetic behaviour. I’m sure they’ll have him call Claire “first wife” a few times though to drive the point home. Every time I read/listen to these scenes from Madam Jeanne’s I’m still baffled how I did not notice that obvious hint the first time I read this story. I blame the “Claire & Jamie are reunited haze” on my brain. Talking about Madame Jeanne’s: I wouldn’t mind if they cut the Whore’s Brunch as such as well, because even though it’s quite entertaining it’s not really vital to the plot. The story of the “Fiend” who goes around killing women in Edinburgh is, but that comes up after the brunch anyway. I’m not sure how many new sets these chapters actually need, we’ve already been to Madam Jeanne’s and later on we return to the printshop. And burn it down! I’m curious how they will do that, from a mere technical point of view. I also hope John Bell isn’t afraid of fire or heights. But I guess they’ll have stuntmen on set for that part anyway… There also is the tavern where Jamie and Claire run into Sir Percival and in which they rent a room and talk some more… Well, they don’t just talk ;-) A few vital conversations happen there, but I’m sure these could be switched around to other scenes in these episodes. We finally meet Ian again and I hope they’ll keep that scene when he shows up at the brothel and mistakes Claire for a whore in Jamie’s bed. Not just because parts of it are funny, but also because it shows how much Jamie’s and Ian’s relationship has changed, or more precise, how much Jamie’s illegal activities put a strain on their friendship. Because he’s getting further and further away from Jenny and Ian, not just geographically and it ends with a big blow after they rescued Young Ian from the printshop. By the way I would love to see more of how Jamie turned from smuggler to printer to seditious writer, but I guess that’s too much backstory to include in the show. The scene with Young Ian surprising Claire in the brothel bed later on is equally entertaining, so I hope they’ll keep that in as well. I’m really looking forward to seeing Young Ian on the screen for the first time. I got a glimpse of him in the fan photos from the filming in Edinburgh. Just a few days before that I had listened to the part where the printshop burns down and Young Ian sends his father away to tell Jamie about the man he killed in the fire and my heart broke for him. That’s another scene I hope they will keep in. And of course we will finally meet adult Fergus as well. Casting Cesar Domboy for that part was such a great idea. Not that I’ve seen him in any series or movie before, but he definitely looks right. I mean, come on…. So so right. The way Fergus falls on his knees in front of Claire, when they meet again is one of my (many, many) favourite moments of this part of the story, so they better keep that in as well. Then of course all through these two chapters there are precious moments with Claire and Jamie, where they talk some more about how they have felt while they were separated and how they feel now and every single scene is giving me all the feelings, so I hope we’ll see most of those at one point or another in the span of these episodes. I don’t care when or where, I just want to see and hear it!